Moving or relocating can be stressful sometimes, but you can lessen the stress of this particular task by using a professional moving company. Why take the chances in damaging your belongings when in fact you can just leave it up to a professional when moving from Florida? Aside from that, professional movers are also fully insured and have all the necessary experience of moving your valuables without damaging one. If you hire moving services, you will not only have an easy time to prepare for the relocation project but is also very cost-effective because they have all the moving materials that will be needed, so it eliminates the need for you to buy or rent those packing materials or moving blankets. Another advantage is that they can pack more efficiently and faster than you because they are well-trained and certainly know how to handle delicate and fragile items. One major benefit of hiring moving services to help with the relocation process is that is that the moving estimator will offer you a valuation insurance. That will cover, at least, part of the value of the belongings that you will be moving. Another option is buying extra insurance if you feel that the one included is significantly inadequate. We are a family business with more than 30 years in the moving industry offering our customers local moving, long distance moving, packing services, warehousing and piano moving. We can help you move to another state or city giving you the quality service you deserve. 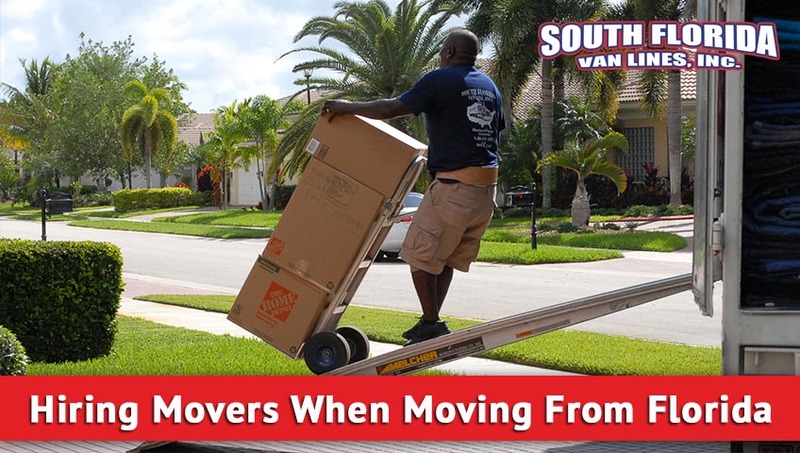 Do you need more reasons to hire movers when moving from Florida? The convenience and safety that you can enjoy when you have a pro to take care of the rest is priceless. Give us a call for your Free moving estimate at 305-912-2338 or visit Moving Quote and we will get back to you shortly!